As this blog and others have discussed, exploit kits are frequently used to deliver malware payloads onto victim systems. Clicking a malicious link in a phishing email, visiting a compromised site, or malvertising on a legitimate site are among the techniques most commonly used by threat actors to lead victims to exploit kit (EK) servers. 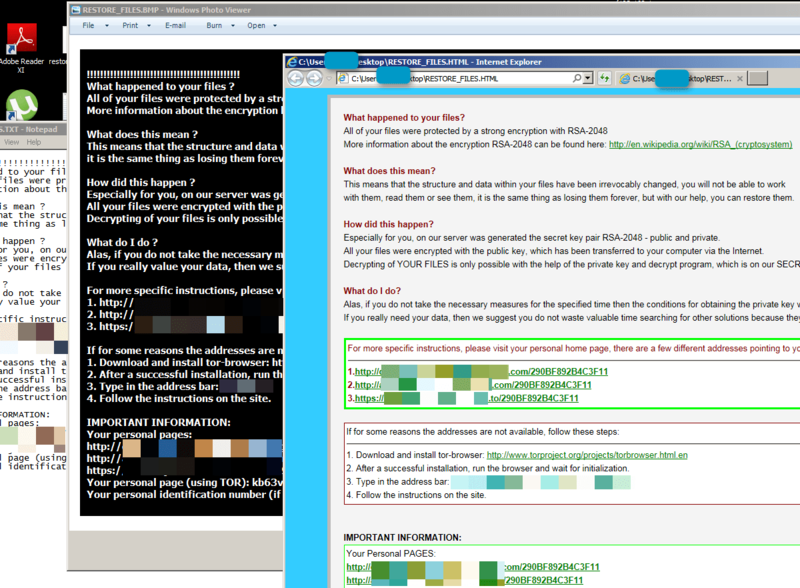 The infection chain reveals a string of affiliate bot owners, starting from the Yorobun  owner, compounding infections deliver – in a single pass by the client – nine additional payloads, including pulling in a different EK to deliver two different varieties of ransomware. 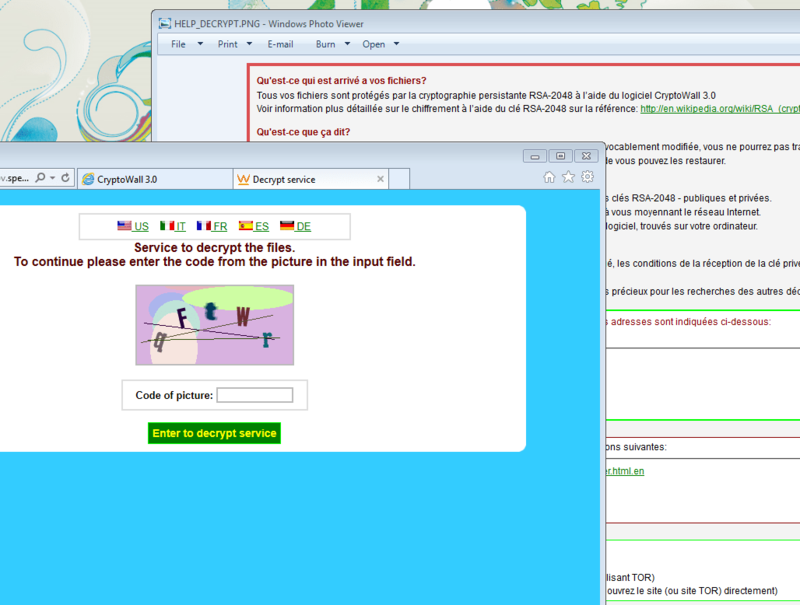 TeslaCrypt  (aka AlphaCrypt) is the first attempted ransomware install (Fig. 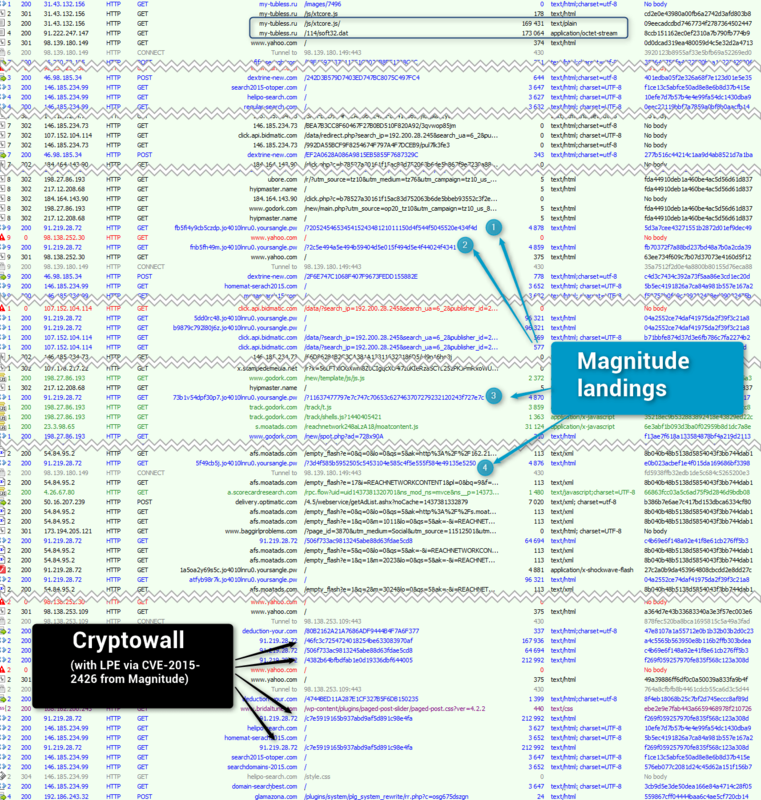 4), followed by CryptoWall  (Fig. 5). In addition to the double-whammy of two different ransomware infections, this clown-car infection chain also drops Bedep, a click-fraud malware that employs a domain generation algorithm (DGA) for its command and control (C2) communications . 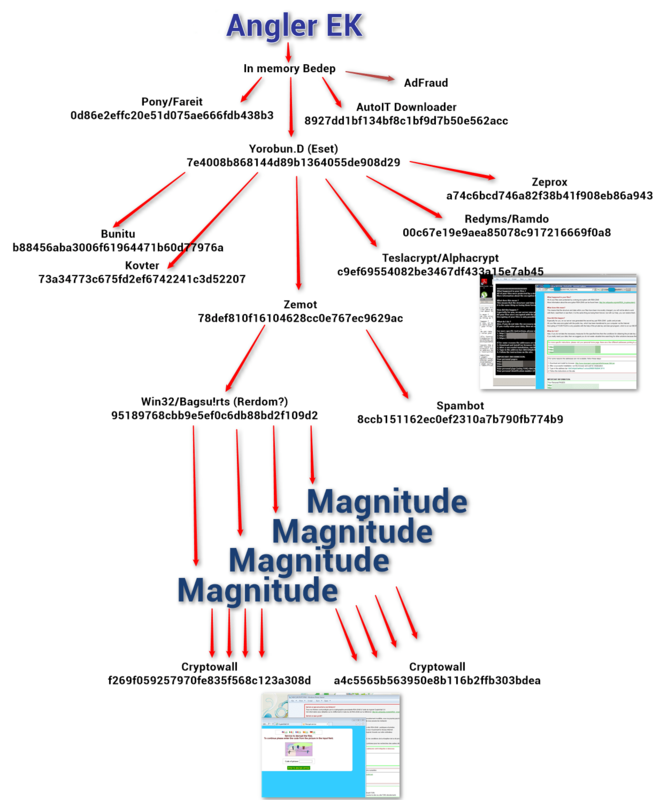 The Angler EK drops a payload (first Pony , then Yorobun) that is not only followed by five more malware payloads, but also pulls in another exploit kit – Magnitude – which in turn drops at least two variants of the CryptoWall ransomware. Although less well-known than Angler, Proofpoint analysis finds that the Magnitude exploit kit has been one of the three or four most used EK’s over the last 90 days, averaging over twelve percent of total EK traffic. Rental of an exploit service can cost an actor up to thousands of dollars per month, so it is natural for actors to want to maximize their chances at infection by using malware payloads rendered “Fully Undetectable” (or FUD) by obfuscation services and aggressively selling traffic and spam services. Conversely, high demand for a particular EK can tempt the owner to maximize their revenue opportunity by selling every infection opportunity to as many affiliates as possible. As this example shows, this can lead to payload after payload dropping out of a long infection chain that highlights the fact that today’s infections are rarely matter of a single exploit delivering a single payload… and in this case resulting in a client that is for all intents and purposes unrecoverable. Despite the entry of new, smaller players, the exploit kit market continues to consolidate around Angler, although it has yet to approach the dominance of Black Hole. While this overloaded infection chain appears to be unusual, it highlights the flexibility and continued threat of exploit kits and the challenge they pose to organizations.